The name of this recipe does not lie...these marvelous scones are truly decadent! Flaky, crumbly, buttery, crispy, and just sweet enough, you'll want to eat more than one at a time! And fresh from the oven, what a treat. 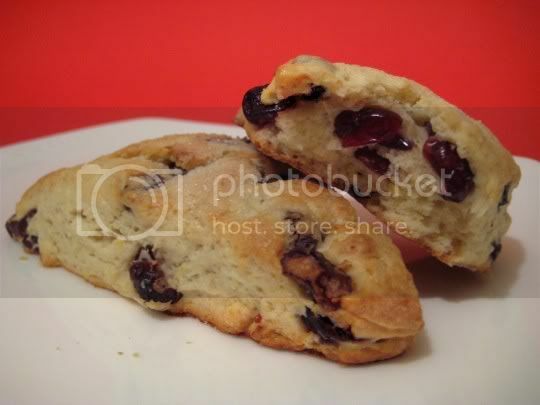 The scone is light and perfectly textured, almost biscuit-like, with a crispy outer crust and soft, velvety inside. They are sweet, but not overly sweet, with a strong lemon flavor thanks to the lemon zest in the batter. In addition, you get more bursts of tangy sweetness because the scones are chockful of dried fruit (I used a dried berry mixture): blueberries, cranberries, raspberries, and cherries abound throughout. So yummy, and can you just imagine these with butter? I halved the recipe (originally makes 18) because I wasn't sure how these would come out. They are fairly easy to make (a pastry blender is your friend), but the dough is sticky, so make sure you liberally flour your kneading/cutting surface. Brushed with cream and sprinkled with sugar, the scones are almost good enough to eat for dessert! And unlike most bakery scones, these (somehow) stay fresh-tasting the next day, without getting all dry and stale (stored in an airtight container). Make again? Yes, yes, yes! I'd love to whip up a batch of these for a group breakfast, especially since most of the ingredients are pantry/fridge staples. Tea party, anyone?